A high school club in Rockport earns one of seven finalist spots in the Volvo Adventure Awards. A group of high school students in Rockport has blown away its U.S. competition in an international environmental contest by installing a towering 100-kilowatt wind turbine on their school campus. 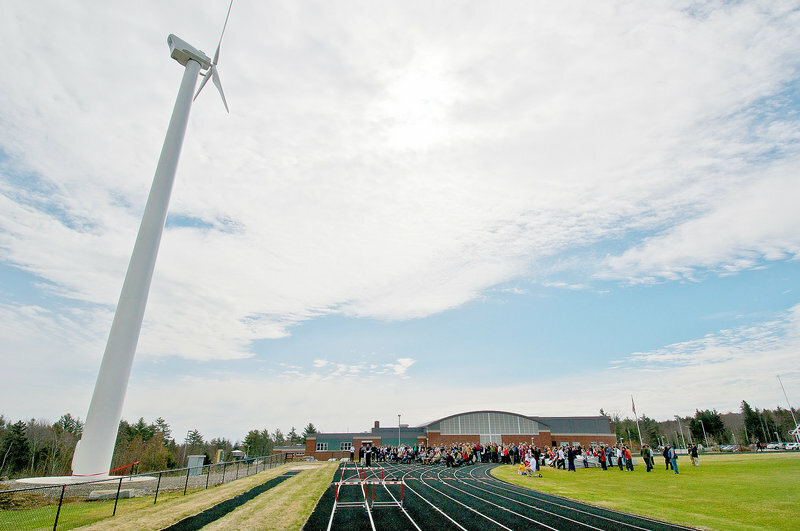 Over the past several years, the Windplanners club at Camden Hills Regional High School has raised about $500,000 from grants and private donors to purchase and install a wind turbine next to the school track. The accomplishment has earned the club one of seven finalist spots in the international Volvo Adventure Awards for student-led environmental projects. Five representatives from the Windplanners will travel to automaker Volvo Group’s headquarters in Sweden to give an oral presentation about their project before a panel of judges. The winning team will receive $10,000, with $6,000 going to the first runner-up and $4,000 to the second runner-up. The Camden Hills students beat out several hundred other entries from dozens of countries to earn their finalist spot. They will be competing against six other teams, each representing a different region of the globe. Their competition includes a composting project by students at a Bulgarian school, a coastal-cleanup project by a team of Indonesian students, and an olive tree preservation project by students in Turkey. The teams will gather in Goteborg, Sweden, on June 14 and present their work to a panel made up of United Nations representatives and Volvo executives. The Volvo Adventure Awards are designed to reward and recognize work being done by people ages 13-16 around the globe to benefit the environment. Volvo is covering all expenses related to the Sweden trip. The representatives from Camden Hills who will travel to Sweden in June are: Chelsea Hunter, Kiera Haining, Maya Sosland, Eliot Grigo and Anna Mynick. Hunter, now a senior, has been a Windplanner since her freshman year. What drew her to the team initially was an interest in environmental science, she said. However, Hunter said she has learned a variety of disciplines while working on the wind-turbine project, skills that should help her establish a career. “It’s more like a college internship,” she said. Mynick, also a senior, said the wind-turbine project has taught her and her fellow students a variety of subjects in addition to the science of wind energy. They also have learned grant writing, public speaking and fundraising skills. Most importantly, she said, the team has learned how to make connections between science and social responsibility. The Windplanners team was founded in 2005 and has lasted through multiple years of students at the high school, according to science teacher and team adviser Margo Murphy. The group’s aim from the start has been to increase renewable energy sources and improve energy efficiency at the high school, she said. For the past six years, the Windplanners’ primary goal has been to raise funds to purchase and install a wind turbine on campus, a goal the group achieved in March 2012. Now, the team has set new goals that include installing solar panels at the school, Murphy said. Mynick said presenting to the judges will be quite a challenge because the team must figure out how to compress the details of several years’ worth of effort into a five-minute oral presentation. “We have to make sure that we have every second planned out,” she said.